I've been on some crazy diets in my lifetime. During my college years, I used to be really restrictive when it came to certain types of food/drink. Those who know me now and know how much I love my fountain cokes will be shocked to know that for years, I didn't drink any soda. Some time during my early 20's I reached a point in my life where I sort of threw all the rules I'd learned about dieting out the window. I was so afraid to just eat what I wanted for so long and when I finally got to a point where I stopped restricting myself, I actually lost some weight and started to feel good about my own body image. Once I stopped analyzing my diet so much, I had time to pay attention to my body a lot more. If I was hungry, I ate. And I stopped feeling guilty for what I was eating, even if it wasn't exactly low in calories or saturated fat. I quickly came to the realization that I'm not actually a big eater and I think a lot of the initial unintended weight loss came down to portion size. But perhaps the biggest lesson I learned is that my body knows what it needs to feel balanced. Nowadays, I don't diet and for the most part, I'm lucky enough to be able to eat what I want. I realize that this might drastically change as I age, but for now, I just try my best to keep things in moderation and incorporate healthy food into my diet as often as possible. One rule that I do try to follow as much as possible is to try to eat healthy during the day so that I don't have to feel guilty for eating whatever I want for dinner. So I'm always on the lookout for healthy breakfast, lunch and snack ideas to avoid eating the same things every day. 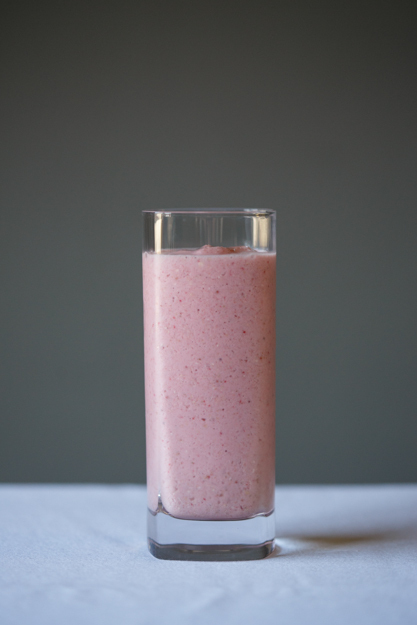 I recently came across this Oatmeal Smoothie recipe and decided to make a variation of it for breakfast one morning. And it completely blew my mind. Not only is it healthy, it actually fills you up and tastes amazing. And it helps to keep your digestive system regulated...just trying to keep it real. But perhaps the thing I like the most about it is that I can change up the taste by only changing one simple ingredient. I've been making it a few times a week for a while now and I'm still not sick of it. So if one of your new year's resolutions is to eat healthy or you're like me and you're trying to live a more balanced lifestyle, then this is definitely something you'll want to try. Here's my variation of the recipe for a single serving. *I find that I only need to add honey if I'm using a more tart fruit such as raspberries. When I'm using strawberries or pineapple, I don't add it. Mix all the ingredients in a blender until smooth and you're good to go! Oatmeal, huh? May have to give that a try!